Our new Northeast Kingdom Century Weekend is a child of Hurricane Irene. Due to extensive hurricane road damage in southern Vermont (now repaired) we were unable to operate our Vermont 100/200 in September 2011. A natural alternative was to head north, where there was no storm damage and wonderful cycling terrain. Fourteen cyclists joined us for the weekend and loved it so much they demanded we offer it as a regularly scheduled tour. We are happy to oblige. The Northeast Kingdom of Vermont is just that, a kingdom. The most rural and scenic region of Vermont, dotted by glacier-formed lakes and villages that time has forgotten, is our home for the weekend. 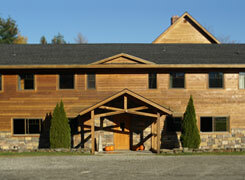 We'll spend two nights at The Jay Village Inn in the shadow of Jay Peak Ski Resort. Saturday is Century Day. We ride east from Jay through Newport and the sleepy towns of Derby Center, Morgan and Island Pond on our way to East Burke, home to Burke Mountain Ski Area and the Kingdom (mountain bike) Trails. We'll have lunch here with several options to refuel for the second half of the day. The afternoon highlight is pedaling the east shore of narrow Lake Willoughby. The scene is dramatic with Mount Pisgah to the east and Mount Hoar to the west rising straight up from the waters. Less dramatic, but beautiful cycling carries us back to the inn where you may refresh at the pub or by the pool or hot tub. 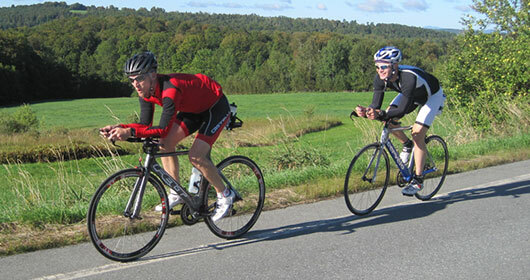 Sunday offers two routes measuring 63 and 82 miles. We all begin with a peaceful and scenic warm-up spin within a stone's throw of the Canadian border (bring your passport if you would like to cross over!). We follow the Missisquoi River all the way to Richford before turning south to Montgomery, passing three classic covered bridges on the way. Next stop is Belvidere where cyclists will make a choice between the 63 and 82 mile routes. The shorter option takes a direct route north back to Jay while the longer loop continues south to the lively village of Johnson, home to Johnson State College and the Johnson Woolen Mill. Everyone finishes on a lovely stretch of famous Route 100 on the way back to Jay. This is a challenging ride, with not-to-be-missed scenery and is only offered once during the 2012 season. It will likely sell out. Don't wait – sign-up today!